There's gold in them thar hills! I believe that the area of Ipswich known as California took its name from the great rush for the shiny stuff sometime in the 19th century. A landmark up that end of town is The California Club, home to some cool jazz on a regular basis. Nice. Not terribly close to there -- actually on Spring Road -- is the California Grill. On the list for ages, we're about to finally tick it off only to find it closed at lunchtimes. Darn and drat. Into the dreaded one-way system, left past UCS, right past the Travelodge and there's a sweet spot outside Tesco. 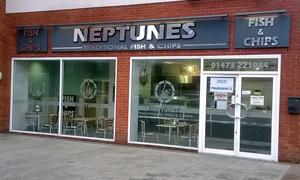 We can do better than that, for next door is a chippy with seats (minimum requirement for LL inclusion). I'd like to say that, like the heavenly body, I discovered Neptunes by mathematical prediction. In reality, I've seen it many times while driving past. Silver letters say this is named after the eighth planet. Sign in the window begs to differ and points out that it's "under new management" as Mariani's. That's one notch higher in the alphabet. Other folk are eating in, a good sign, and there's the EADT and, er, The Sun. Although a tad chilly in there, guy behind the counter gives us a warm welcome. Meal deal, please: chicken burger (with a choice of sauces) plus chips plus a cherry Coke (go easy on the fizz or you too will turn into a gas giant). Just the job on a windswept day -- champion chips -- and, since we're seated at tables, served on a proper plate. Classy touch. Oh, and 20p for a sachet of proper Heinz ketchup. Traffic is queueing outside heading into town due to roadworks and the scheduled closure of the Orwell Bridge at 2pm: Mr Grid, meet Mr Lock. We're suggesting to Friar Tuck that he could make a killing by selling hot potato-based snacks to the motorists parked outside. He counters with talk of a bloke who used to sell papers and coffee to drivers stuck on Bishops Hill. Unlikely enough to be true. Topped off with a hot Ritazza and sneaky Malteaster back at the hub, that was a good outing. If you're flying past in Voyager 2, 3 or 4, give it a probe. If it was a car -- Trident Clipper. If they were passing by -- Marianna Palka.